Winter themed craft die featuring a park bench and a street light. Lawn Cuts custom craft dies are high-quality steel, made in the USA, and are compatible with most die cutting machines! Winter Penguin Lawn Cuts coordinate with the stamp set Winter Penguin. Sequins designed for the holidays. Contains a unique mix of colors and sizes/shapes. 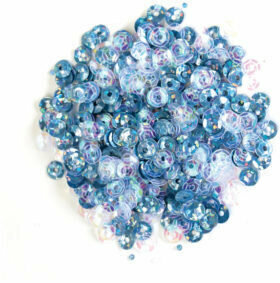 Perfect for shaker cards, or as a pop of color to embellish cards and layouts. 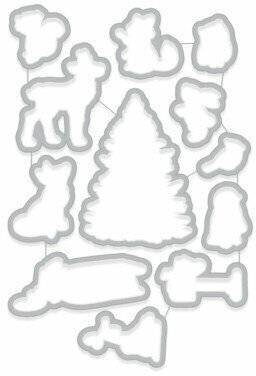 This embossing folder will emboss a lovely winter nature scene with snow and trees. Size: 6in x 6in. Marianne Design-Craftable: Wreath. This die set makes a beautiful 3D wreath for your project. Cut more leaves for a fuller look to your wreath...Additional elements include a bird, leaves, pine branch, pine cones and branches. Lots of options for a variety of looks. 6 dies Sizes: Smallest: 0.40" x 0.60", Largest: 4.33" x 4.25".